In a medium bowl, combine the olive oil, garlic, oregano, dill, and pepper. Add the stuffing mix and stir to coat thoroughly. 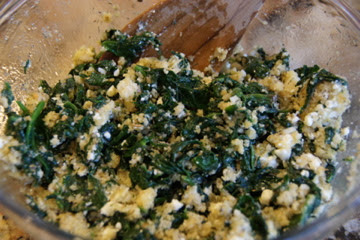 Add in eggs, spinach, and feta and mix well. Heat a non-stick skillet over medium heat. Shape the mixture into patties. Cook the patties until golden brown and heated through, about 4 minutes on each side. Serve on buns and top with red onion, crumbled feta, and greek yogurt or spicy mayo. Enjoy!